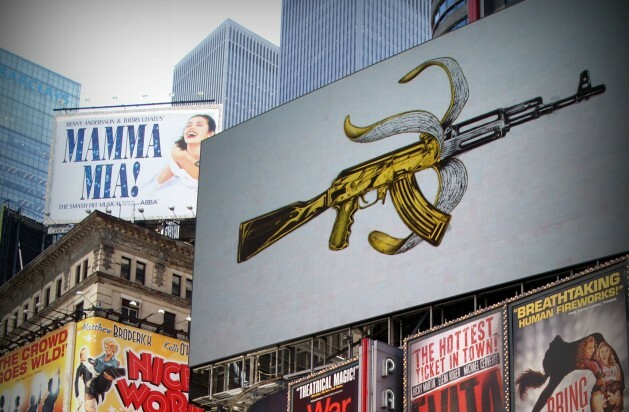 A campaign in support of the Arms Trade Treaty argued that weapons were subject to fewer regulations than bananas. Credit: Coralie Tripier / IPS. UNITED NATIONS, Dec 27 2016 (IPS) - Two years after the UN Arms Trade Treaty entered into force many of the governments which championed the treaty are failing to uphold it, especially when it comes to the conflict in Yemen. The Saudi-led international coalition has been responsible for thousands of civilian deaths in Yemen, and Saudi Arabia is known to have violated humanitarian law by bombing civilian targets, including hospitals. The conflict in Yemen – the poorest country in the Middle East – has displaced over 3 million people since it began in March 2015 according to the UN. “The big disappointment is the countries that were in the forefront of calling for the treaty ... are now prepared to violate it by persisting in their arms sales to Saudi Arabia,” Anna Macdonald, Control Arms. The U.K.’s sale of weapons to Saudi Arabia has been the subject of intense debate in British parliament. Saudi authorities recently confirmed that they have used UK-made cluster munitions in Yemen. “Evidence of cluster munition use has been available for almost a year, but the U.K. has ignored and disputed it, trusting instead in the Saudi-led coalition’s denials,” said Macdonald. The UK which sold the weapons to Saudi Arabia in 1989 has since signed up to the Cluster Munitions Convention, which prohibits the sale of cluster munitions because of their indiscriminate nature, Macdonald added. Meanwhile recent reports suggest the United States is curtailing at least some of its arms sales to Saudi Arabia. “The U.S. has said it will halt the sale of precision-guided aerial bombs to Saudi Arabia because they have seen “systemic, endemic problems with Saudi Arabia’s targeting” that the U.S. says has led to high numbers of civilian casualties in Yemen,” said Macdonald. However she noted that it is hard to know what effect this will have on policies under the incoming Trump Republican administration. According to research published by the Stockholm International Peace Research Institute (SIPRI) the world’s top three arms exporters are the United States, Russia and China. India, Saudi Arabia and China are the world’s top three arms importers.